In the wake of Donald Trump’s surprise presidential election win, Americans have been bombarded by images of protesters across the country. One of the most ardent scenes has been Portland, Oregon, where the mostly 20-something angry crowd have gotten violent with both humans and property, to a degree that many are questioning their motives. Do they really feel so much angst over the election results, or are they just an angry mob hell-bent on destruction? The answer may lie in some interesting statistics gathered from Portland demonstrators’ arrest records. It turns out that of more than 100 protesters detained in the city, at least 50 percent of them never cast a vote for any candidate. While police have been trying to allow peaceful protests to continue unfettered, in Portland, over two days in mid-November, they had to move in when a mob started throwing bottles at them, while simultaneously blocking railroad tracks and destroying personal property. In matching up Oregon election records later with those who were arrested, it turned out that upwards of 70 percent of them had never even bothered to register and/or hadn’t voted at all. 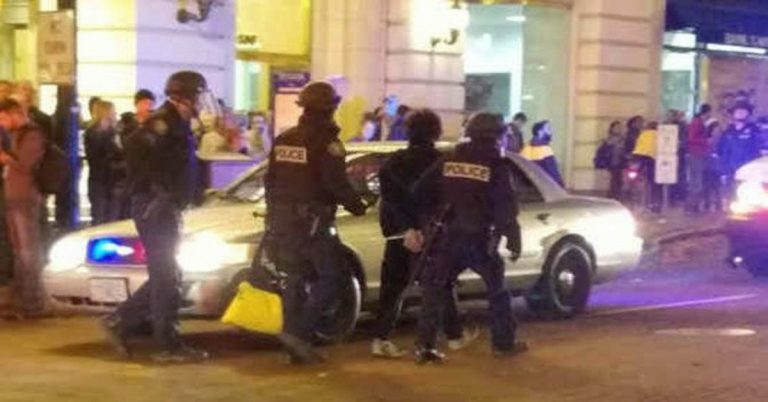 In fact, of 112 total rioters detained, it turned out that only 33 had actually voted in the November 8 election, according to station KGW, which got the information from the Multnomah County state voter logs which had been matched up with arrest records. The interesting, and some would say, disturbing, statistics point to two possible conclusions: 1) that this year’s lower voter turnout, compared to Barack Obama’s two runs, may be mostly reflected in the millennial generation and 2) that many of these demonstrators may have been paid to come in and stir up trouble, as has been alleged by many groups. But where things really get interesting is in noting that while the nation may have underperformed in the voting category, Oregon itself actually had its biggest voter turnout ever, with some two million citizens turning out on Election Day. Still, that means that only four out of every five Oregonians voted, leaving quite a few decisions on the table. Should you be able to protest if you never even bothered to cast a vote? Many Americans feel the answer is “no,” particularly in the wake of learning that protesting football player Colin Kaepernick, who’s expressed his personal unhappiness with how African-Americans are treated in the US, not only did not vote this year, but has never registered to vote in any election, ever, according to several recognized news outlets. It does beg the question: do these people really want change, or do they just like making noise? We’ll leave the answer to that one up to our readers.